Since the start of the LED lighting revolution plastic optics have been made primarily from acrylic (PMMA), polycarbonate or a modified version of either material (for example PMMI). More recently silicon-based optical materials have grown market share. These silicone resins are suitable for precise molding and can be used for refractive lenses, TIR lenses, reflectors, diffusers and other optical components. 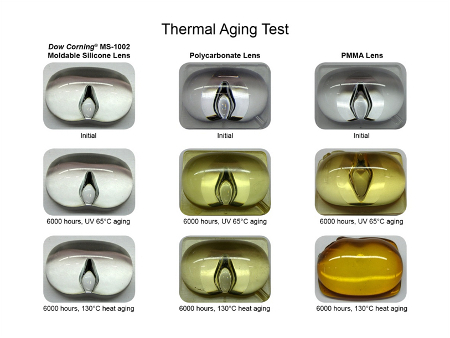 and Poly Carbondate and PMMA aging.